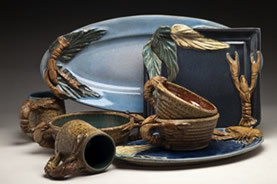 Visit the studio of nationally known potters David & Emily Wortman located on a working rice farm in the heart of Cajun country. 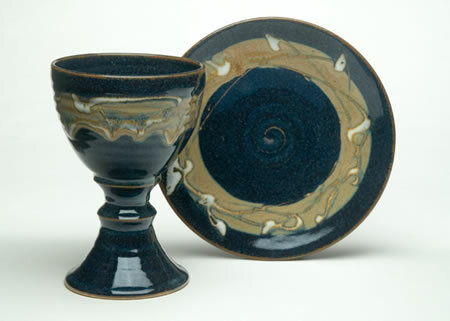 Click here to see our collection of Chalice and Paten sets. Click here to see our new collection of tiles. 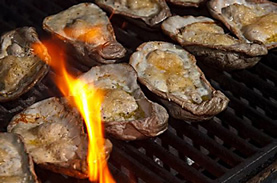 Our stoneware was recently shown in Louisiana Cooking magazine. The photo features one of our fleur-de-lis pieces. Click here to see more of our fleur-de-lis work. 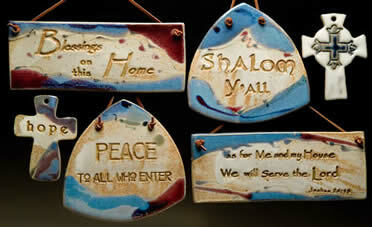 Visit our products page to see our new line of liturgical pieces. In addition to his pottery skills, David is a well known photographer. He is now providing his services to artists around the country. If you need sets of show application slides or product images for brochures or web pages, check out http://www.DavidWortmanPhotography.com. Looking for Vestments, Altar Dressings, Religious Banners and the like? Check our our friends at Holy Orders Liturgical Threads.